BBC - Get your creative on with Anim8! 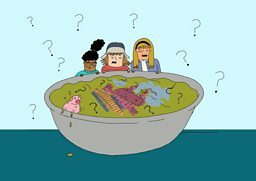 We're incredibly pleased to announce Victoria Manifold and Hannah Jacobs as the winners of the channel’s first animation pilot scheme, with their surreal 2D animated comedy Mystery Soup! Writer Victoria Manifold and director Hannah Jacobs will now work with CBBC and BBC Worldwide to develop their project through to a pilot, which will be delivered later this year with development being headed up by Sarah Muller, CBBC’S Creative Director, Scripted, Animation and Co-Productions at CBBC and Nathan Waddington, Head of Children’s, Scripted at BBC Worldwide. ANIM8 winner Mystery Soup follows three plucky thirteen-year-old girls, who find themselves plunged into mystery at a handsome school for dedicated boys and girls. Hen, Olive and B are bold, fearless and funny as they investigate their weird new boarding school and its bizarre goings on. With development already underway, we are as excited as everyone else to see Hannah and Victoria's project come to life! 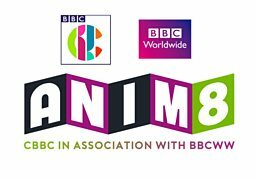 The CBBC & BBC Worldwide team were extremely pleased with the response we had for the Anim8 pilot scheme and were delighted with the eight diverse shows that made it to development stage. Peeled Prawn and Shaved Sheep is an exciting new series following the adventures of a genius sheep and his shell-less friend. With the help of his Prawn Powered Super Shell Suit, Prawn and Sheep battle Mr Big and his gang of Super Villains whilst juggling work, home and finding love with the mysterious Lucia Langostina. With a distinct comic book visual style and clever snappy dialogue it’s the summer blockbuster superhero series with a twist. Peeled Prawn and Shaved Sheep is created by Vince James, Karina Stanford-Smith, Simon Godfrey and Kaine Patel. Mystery Soup is a surreal comedy about three plucky thirteen year old girls investigating their weird new boarding school and the bizarre goings on there. Created by writer Victoria Manifold and director Hannah Jacobs, Mystery Soup follows the adventures of Hen, Olive and B as they find themselves plunged into mystery at a handsome school for dedicated boys and girls. Hannah Jacobs is an award winning director and animator from London. She graduated with an MA in Animation from the Royal College of Art in 2014. Past clients include Vogue, The School of Life, The Washington Post and Harvard University. Victoria Manifold is an award winning fiction writer from County Durham. She has been published by The White Review, The tNY Press and Squawkback, among others. Anarchic and antarctic, Poles Apart is an animated, action packed, character comedy, following the adventures of Ryder, a haphazardly elf banished from Santa's grotto, to live in the South Pole with Santa's brother, Sandy Claus. Ryder's job is to deal with the massive, never-ending, Naughty List, and encounter Naughty Kids the world over! Ryder, Sandy and techno elf Irwin must all work together, despite being completely different to one another, truly making them all Poles Apart! Poles Apart is created by Alex Collier, a Viz comic cartoonist who has recently written on Mr Bean: The Animated Series, and even more recently, the Danger Mouse Comic. The final three projects have been carefully selected following a short development period and reflect CBBC and BBC Worldwide’s aspiration to tap into the wealth of talented individuals who work within the UK’s creative sector, and include several new names as well as established individuals. The projects will soon be pitched and assessed by Cheryl Taylor, Controller of CBBC, Sarah Muller, CBBC’S Creative Director, Scripted, Animation and Co-Productions at CBBC, Henrietta Hurford-Jones, Director of Children’s, BBC Worldwide and Nathan Waddington, Head of Children’s, Scripted at BBC Worldwide. We wish the shortlisted unsuccessful companies/individuals/teams the very best of luck should they develop their ideas further in future. It's been a pleasure working alongside everyone. The Anim8 team are now delighted to announce the shortlisted entries being taken through to the second stage of CBBC and BBC Worldwide's animation pilot scheme. The nationwide search, the first of its kind for CBBC, invited pitches from individuals, studios and companies, and received close to 300 entries, from animators, writers, designers and storyboard artists across the UK. The eight entrants will now develop their submissions further with the support of CBBC and BBC Worldwide. Submissions will be assessed again in March and successful entrants will be taken through the next steps of the multi-stage development process, including a pitch to the CBBC & BBC WW teams, culminating in the announcement of the project being taken forward to pilot stage around April/May 2016. We wish to thank everyone who sent in submissions. Due to the amount of submissions we will not be able to provide feedback on unsuccessful projects. What happens next for the lucky selection? Register your project by filling in the submission form and submit relevant material. Although we do not expect fully formed ideas at this stage, we will need enough content to allow us to fully assess your submission by a panel of judges from CBBC and BBC Worldwide. Please note that all submissions received underwent a two-part Judging Process - part one was to review an applicant's eligibility and part two was a detailed evaluation of their project. Submit developed work for further assessment. with companies or individuals to realise the potential of their pitched project. What was Anim8 all about? In collaboration with BBC Worldwide, CBBC launched a brand new animation initiative, Anim8, an amazing opportunity to develop the next generation of UK animation giants. This exciting partnership is offering UK innovators the chance to pitch for funded development which will, with time, lead to the creation of a range of UK animated properties that have genuine global appeal. We were looking for new content which is original, character driven, fast-paced, funny and has great kid appeal. We were looking for compelling content that is energetic, unpredictable and up-beat with a unique take on contemporary life.